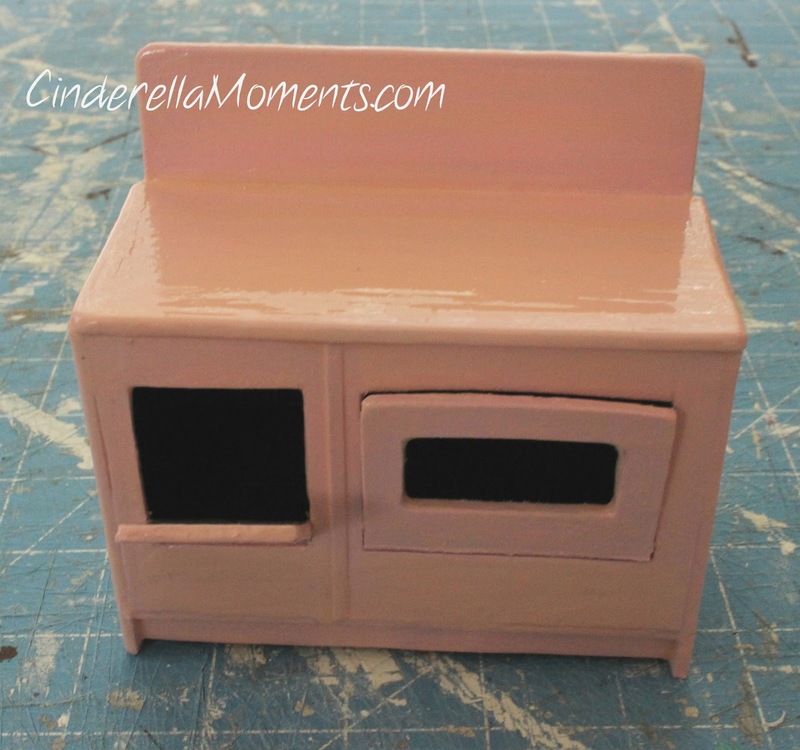 I needed a vintage style miniature stove & oven for the Wiltshire Cottage dollhouse. 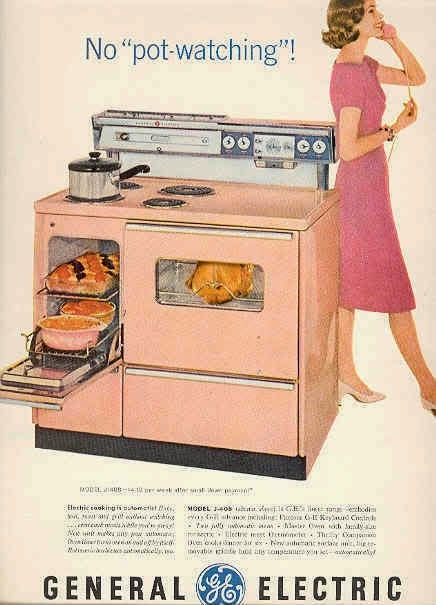 I saw an old ad for a GE stove. 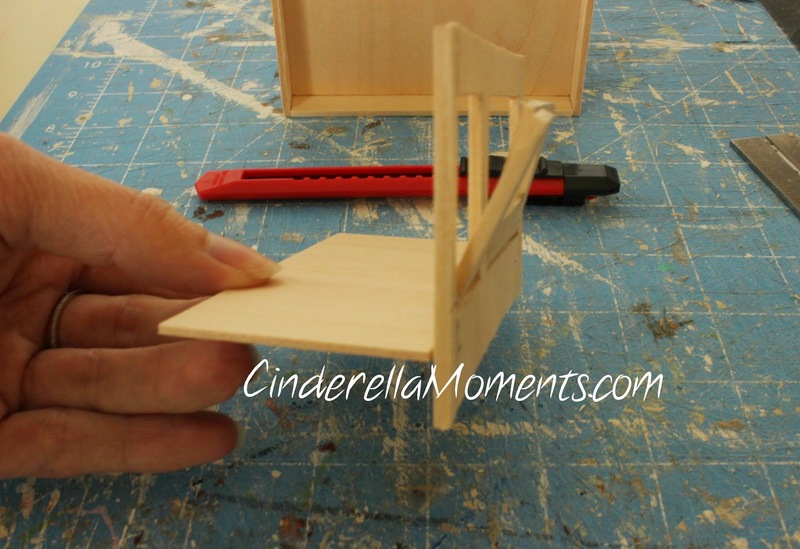 To make a miniature 1/12 scale dollhouse cooking range I worked with 3/32" thick veneer wood. I buy mine from Hobby Lobby. 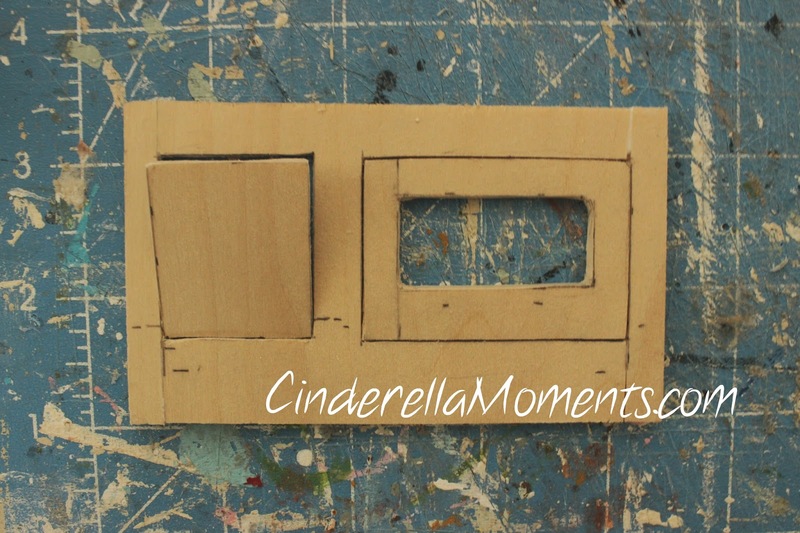 I cut out the back of the stove 4" x 4". The two sides are 2 7/8" tall x 2" wide. And a bottom 1 15/16" x 4" which I kept 3/8"off the ground. 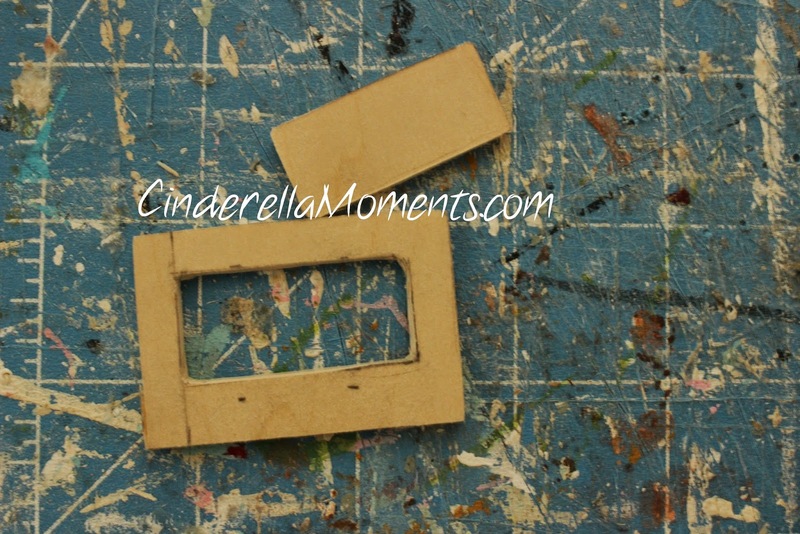 For the front I cut out a 2 3/8" x 4" rectangle. 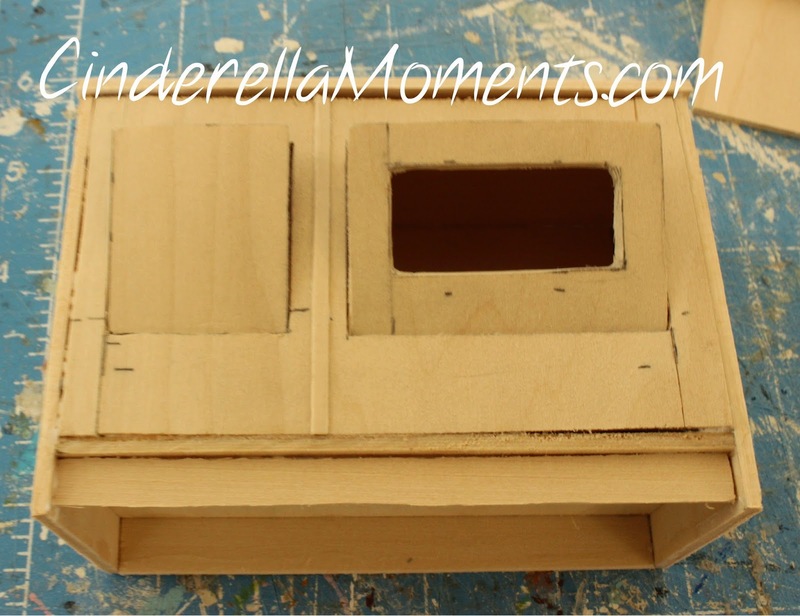 I cut out 2 holes for the doors. The little door is 1 1/8" wide x 1 3/8". The big door is 2" x 1 3/8". I left a 5/8" space at the bottom to put some fake drawers. The little door does not have a window. But the larger one does. 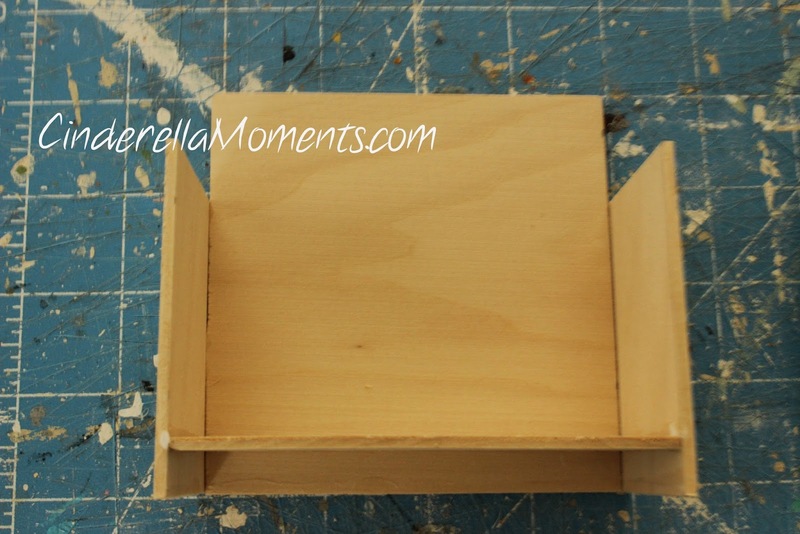 So cut out a rectangle where plastic will go later. My window is about 1 3/8" x 5/8". To have working doors I am using 26 gauge wire. This is where I encountered my first problem. To get the doors on I had to remove the 2 sides so I could get that wire piece in place. 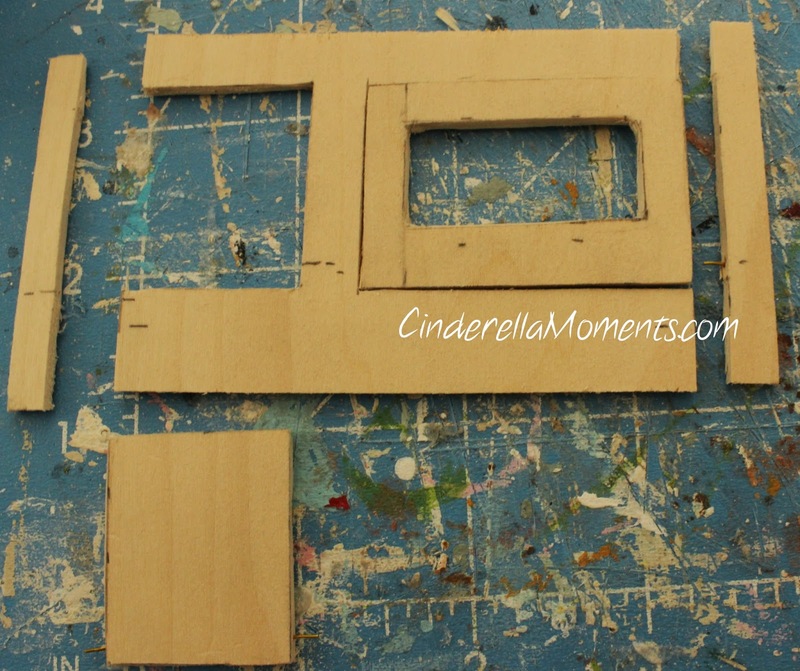 Then I glued the 2 pieces back on. I use Aileen's white glue. Now my front is back together with working doors. 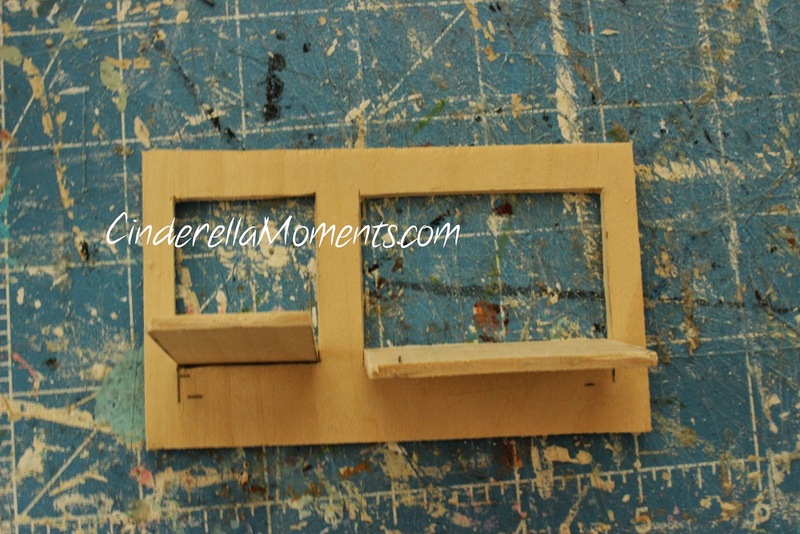 I glued another piece of wood just 1/8" under the doors. You can put it just under the doors. I wasn't sure the doors would swing open if I did. This "shelf" is almost 1 7/8" x 4". 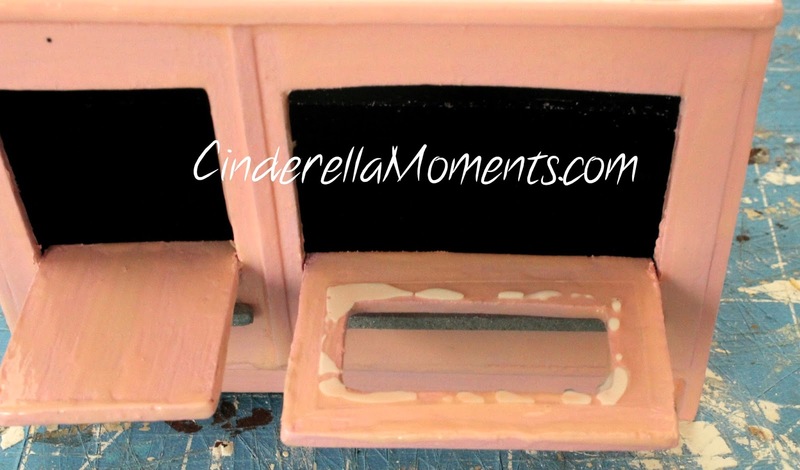 Now glue the front and "shelf to the rest of the stove. Painting the interior now black or whatever color you prefer would be a good idea! I didn't and it was a bit more work later. The top of the stove is 4 2/8" x 1 15/16". Glue it on. I added a piece at the bottom for a toe kick. It's 1/4" x 4". And I added a thin piece to separate the 2 ovens. 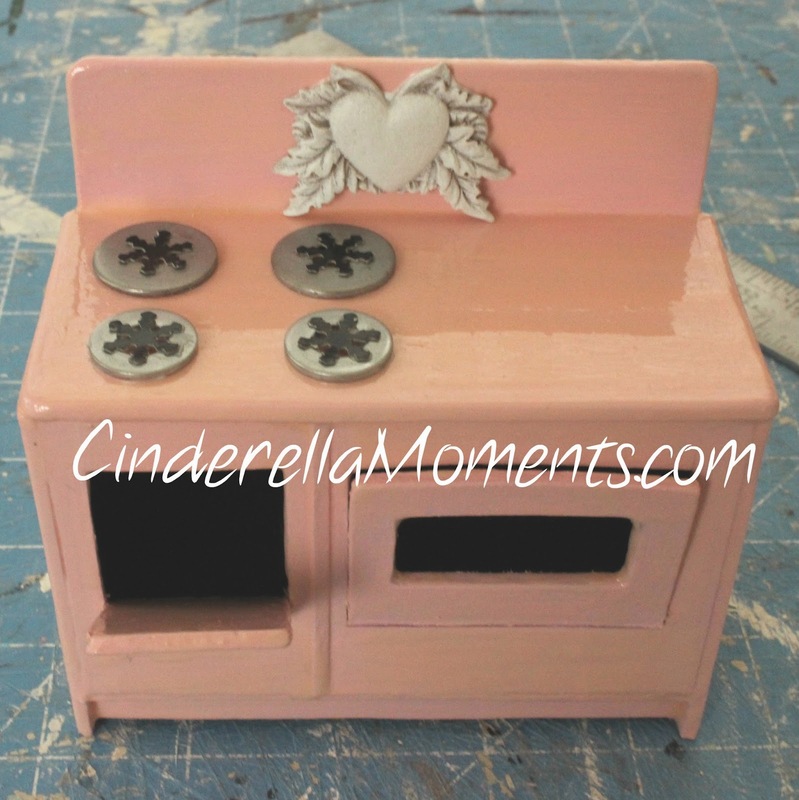 Now the trick will be to see if we can get this to look like a real stove! Sand everything smooth and round all your corners and edges. I am making mine pink. 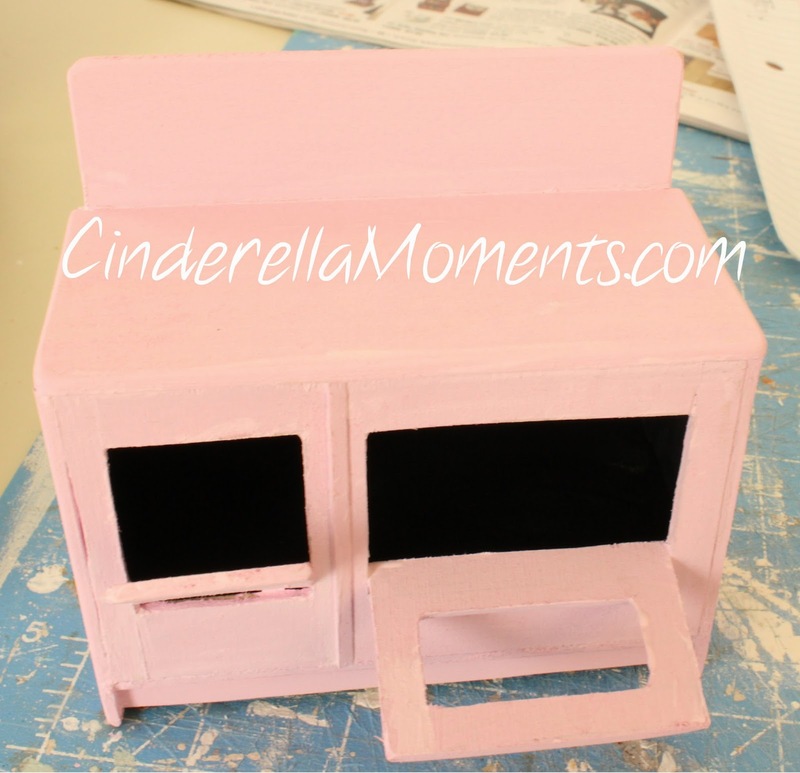 So first I am doing a coat of pink acrylic. 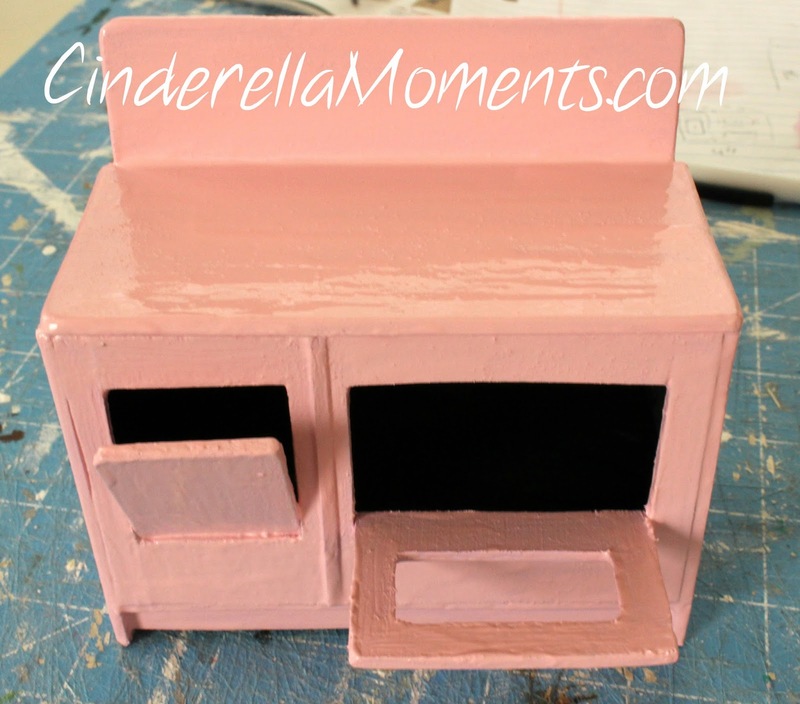 This is Anita's Craft Paint- Princess Pink. The interior is black acrylic paint. Then I tried some nail polish. I have Essie's "Fiji" that is a bit too old for my nails. So I am using it on the range. I think if you just did 4 or 5 coats of water based gloss it would do the same trick. 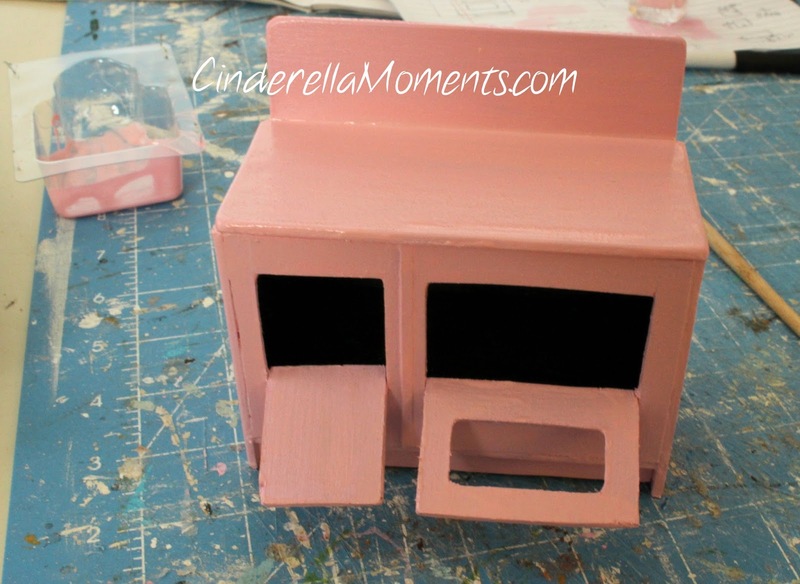 Or you can just use enamel paint. For the first coat I just did a regular coating. The wood did drink it. Second coat, I put on the nail polish a little thicker. It's a bit better looking, but it would need another coat. And I'm out of Fiji! So I'm going to try to gloss the rest of the way. Keeping my fingers crossed! Okay I put on 2 more coats of the water based gloss and it did fine. Except the oven doors grew a bit and won't close now. I'll add the details now. First, the burners. I used 4 metal washers. 2 small that are 5/8" & 2 big that are 3/4". I painted them silver. I have a snowflake hole punch and I used it to punch out the black centers of my burners. I glued the burners onto the range with Aileen's Tacky Glue. Time to add some cute!! 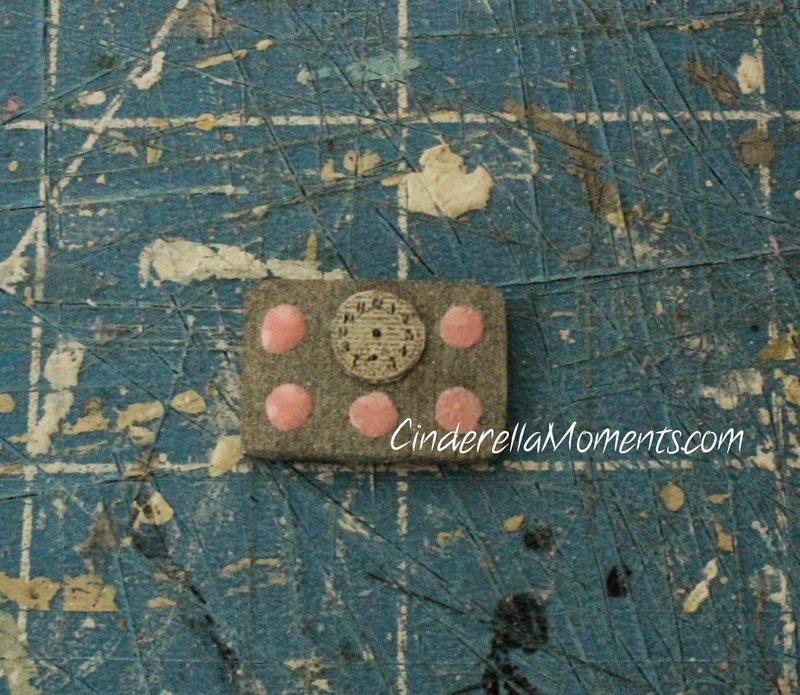 First, I used this heart embellishment by Melissa Frances. It's a scrapbook piece made out of resin. I decided to have a griddle. I cut a little piece of wood 1 1/2" x 1". I sanded all the corners and the top edges round. Then I cut a perimeter groove and grooves in the center. I also made a clock. 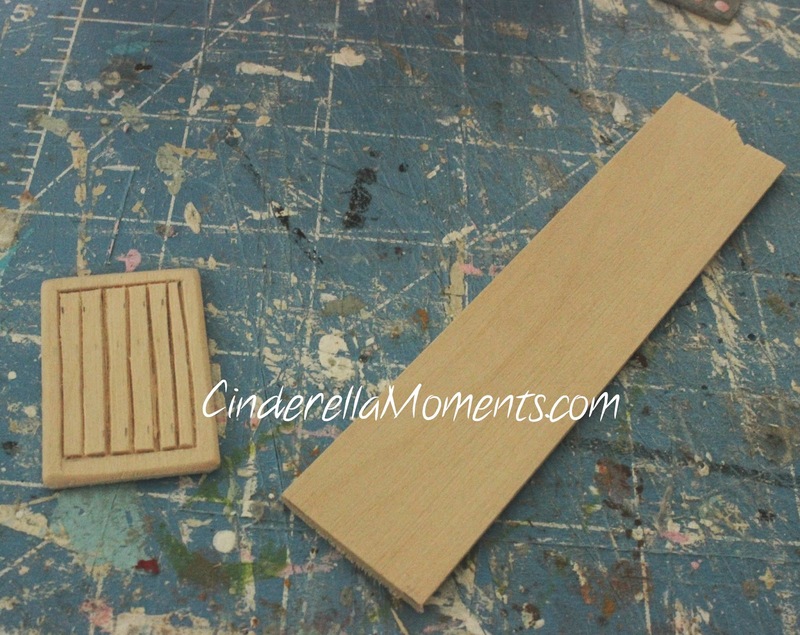 It's a piece of wood 3/4" x 1/2". I cut out a clock face(just type clock face in Google image search and you'll find a whole bunch). Paint the wood silver. The dots are the nail polish. I painted the griddle black. 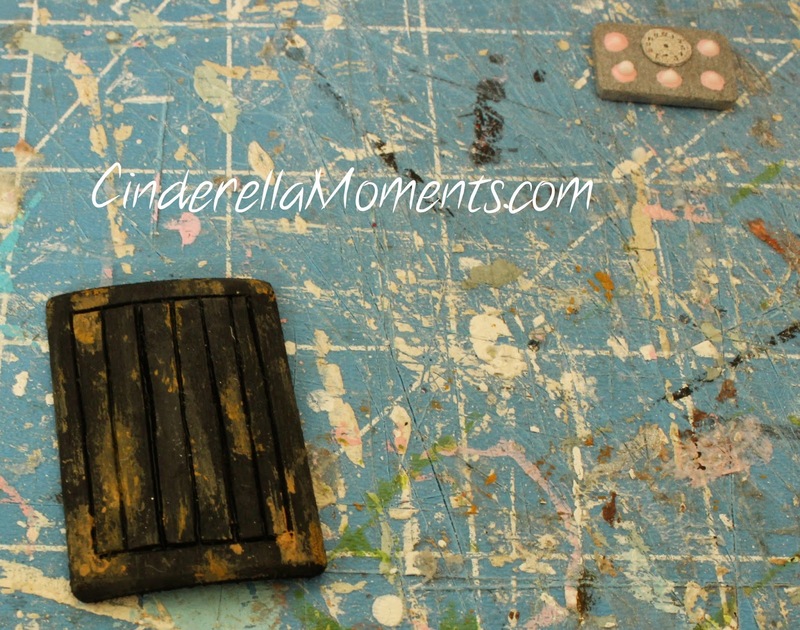 Then I used Folk Art paint "teddy bear" and Apple Barrel's "antique gold" to make rust. The pink dots on the clock part got a dot of Aileen's glue in the middle. I glued the griddle and clock in place. I also added some silver trims. I cut slivers of wood about 1/8" at different lengths to put at the top of the range and the stove. The top ones are 1 1/4" long. The big oven handle is 1 5/8" long. The large drawer under it is 2". The little oven door handle is 7/8". 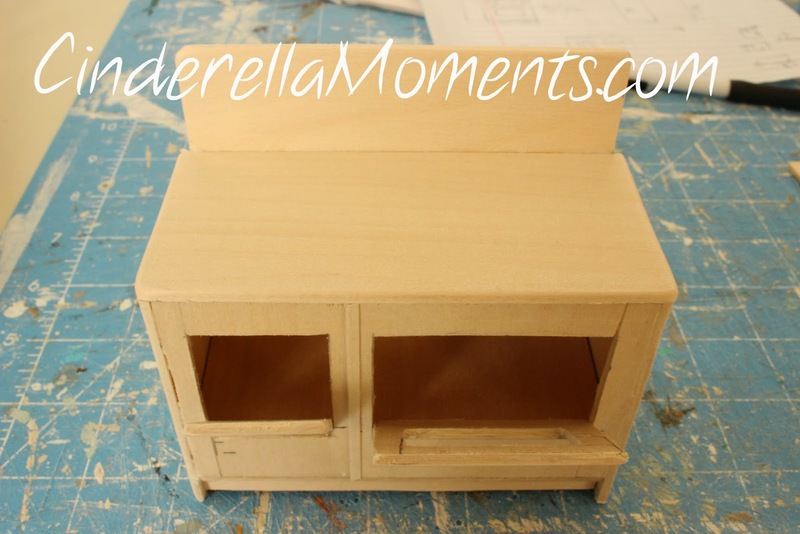 The little drawer under it is 1 1/4". On the griddle, I applied some gloss in some spots. Not all over. Don't forget to glue in your oven window. 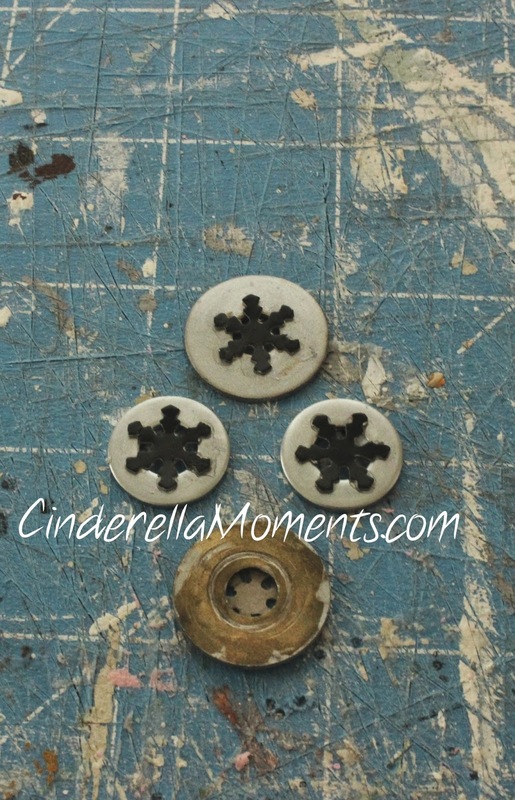 And for the oven knobs I used some metal pieces that held a rhinestone. Remove the rhinestone and you have this 4 prong little domed circle. 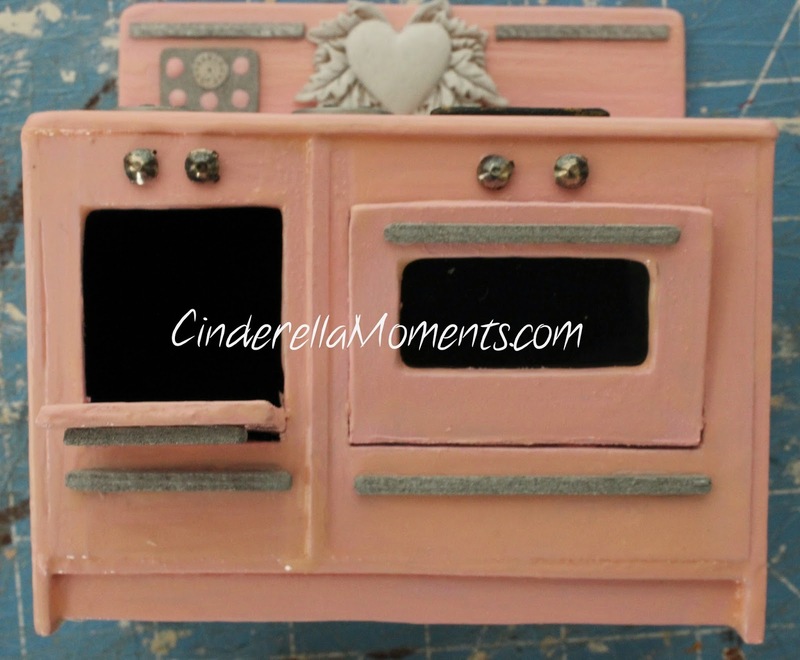 Now all there's left to do is accessorizing your stove! I made most of the items myself. The little spatula is wire, cardboard and glue. The pancakes, strawberries and bread are air dry clay. The eggs are glue and a dot of paint. The pot is a bought item I painted and sealed with gloss. The toaster was a gift from Tracie Dean of Dean Designs that I painted with little roses. The pink polka dot plate is a plate I bought and re painted. And the towel is a piece of fabric I painted with regular paint for the dots. I then put the fabric on a piece of cardboard and pinned in place. Next, I sprayed it with hairspray ( a trick I learned from Liberty Biberty) and dried it with my hairdryer. The baking pan the bread rolls are on is a rectangle bezel pendant from the jewelry department. The vintage stove inside Wiltshire Cottage where it will be residing. I already put up my polka dot wallpaper. I painted the Religieuse/cream puff from a painting I saw on Pinterest by artist Pascal Cessou. I loved it so much I tried to paint my own. 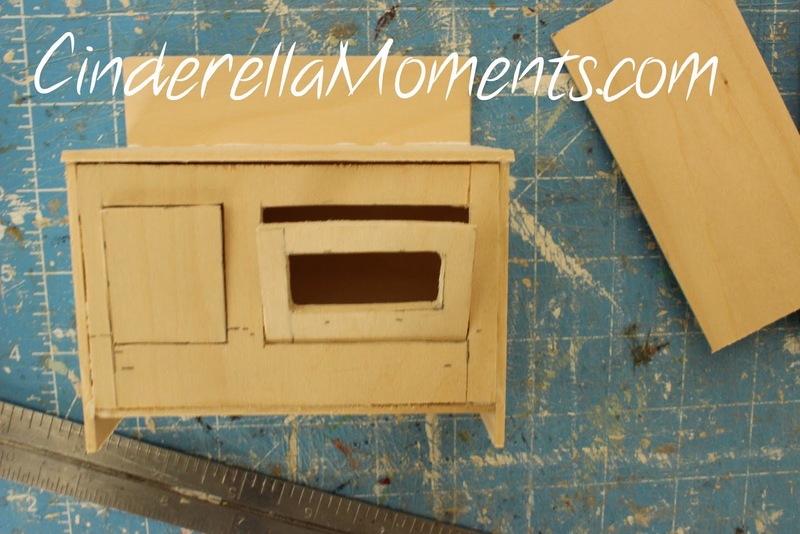 That's my vintage dollhouse miniature stove tutorial! Now it's your turn to make this oven even better than mine. Have fun! I loved it! Thank you for sharing the tutorial! The finished stove with all of its accessories is just gorgeous. You are so clever to make it from a picture. Ничего себе!!!! Вы сделали большую работу! Спасибо за большой учебник! Смотрится замечательно! Картина над плитой великолепная! Вы художник! Amazing as usual. 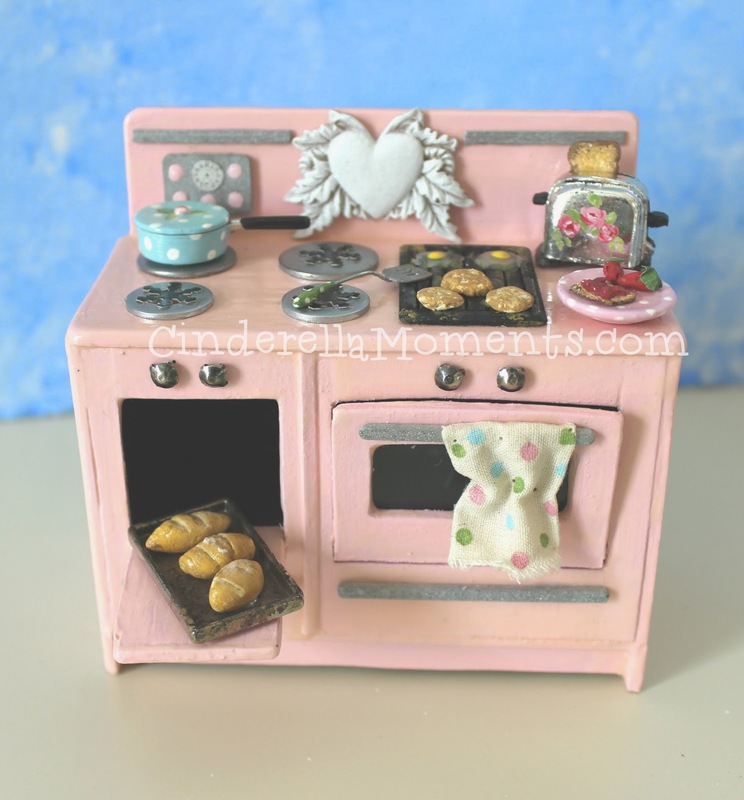 Wish I had this stove in real life! Super Herd ! Tolle Ausführung. Fehlen nur noch die Topflappen ! Lovely! 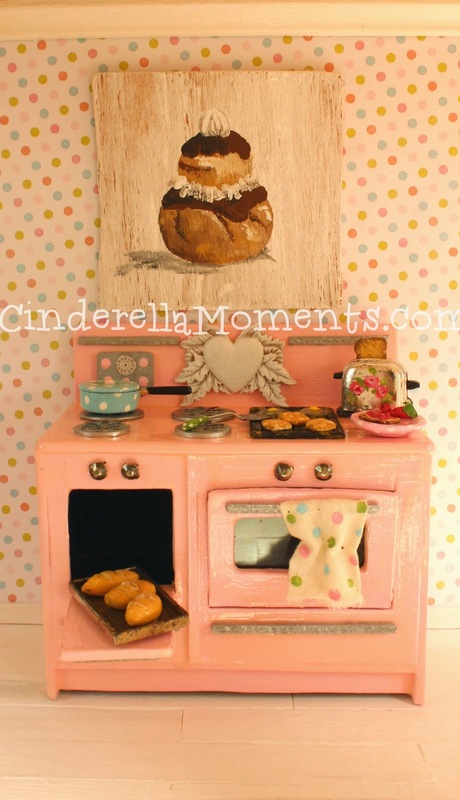 I'd love to do a vintage pastel kitchen. I'm going to pin this! Me gusta mucho ha quedado fantástica y lo bien que lo has mostrado paso a paso, gracias. From nothing has come something great, I love how you have been, you are fantastic!. Your stove with accessories is amazing. Thank you so much, Caroline! It's so cute and you're so clever. Thank you for this most helpful tutorial! 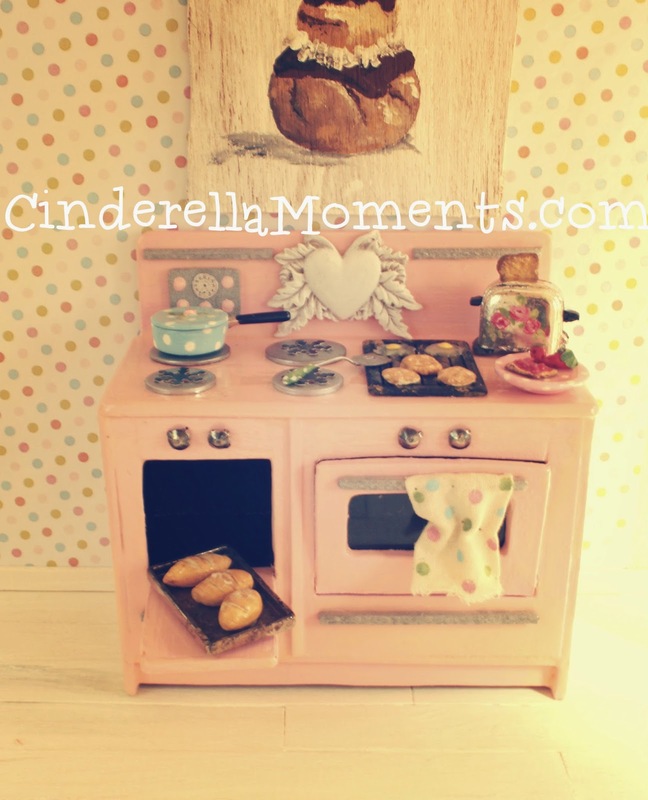 Caroline, your stove is a real Cinderella stove ;)! It is gorgeous! !!!!!! Genial !!!!!! !, me encanta esa cocina y muchas gracias por el tutorial. Wow Caroline your stove is fantastic. Thank you very much for the wonderful tutorial. I love it. Thanks for showing how. it is indeed one Caroline stove. It fits so perfectly to your unique style. I love love it. Wow! I LOVE your stove!!! You have done such a fantastic job of capturing the original one but making it mini and with your own sweet touches! Beautiful job! and thank you for sharing all your "sources"... I would not have thought to combine a washer with a paper snowflake to make a burner! It is Brilliant!!! And I really would not have thought to use nail polish for the glossy finish!!! It is really delightful with your polka dot wall paper! I can't wait to see more! Love your ideas! Fingernail polish is one of my favorite tricks too. I use the glittery kind on my art charms. 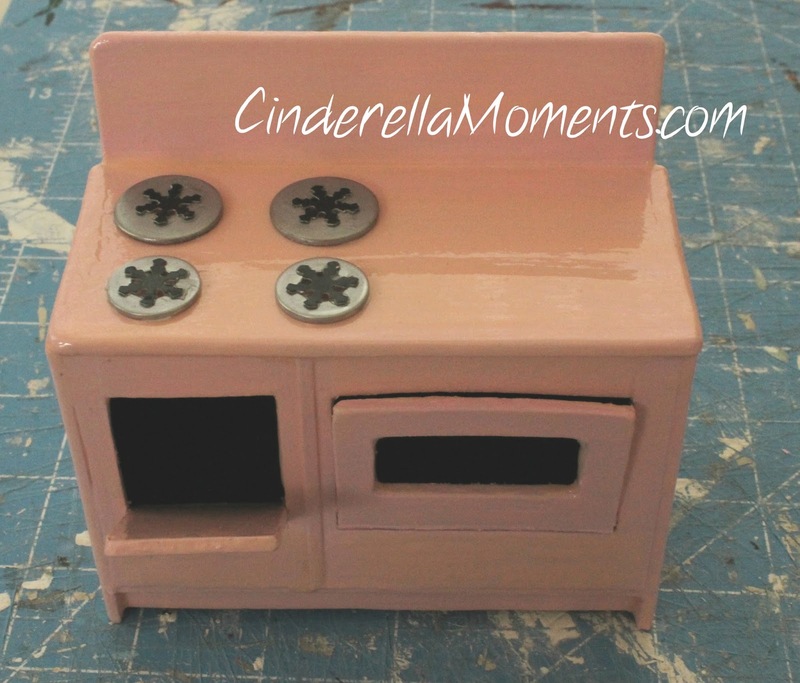 It's a perfect pretty little pink stove and will look darling in your cottage. You're so clever! Es una cocina preciosa!!! y que divertida en color rosa,perfecta para el estilo de tus casas!!! Muchas gracias por el tutorial!!!! 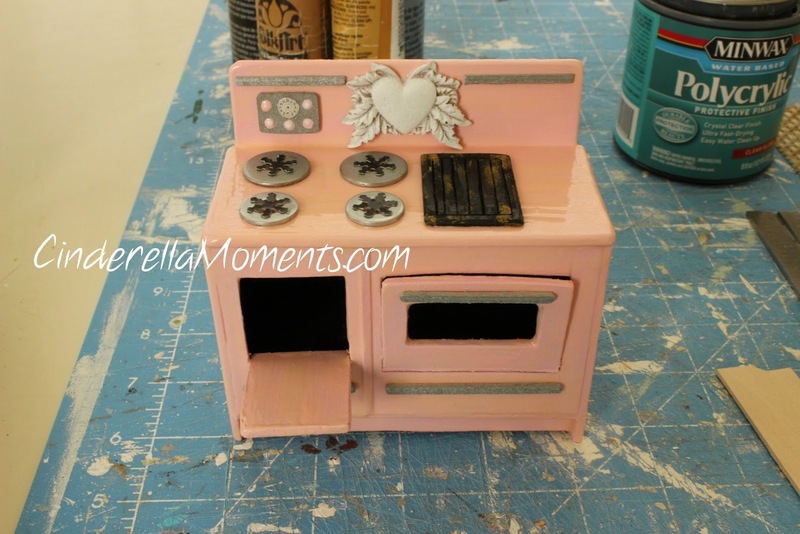 Your pink stove is adorable and I wanted to thank you for sharing this wonderful tutorial!!! 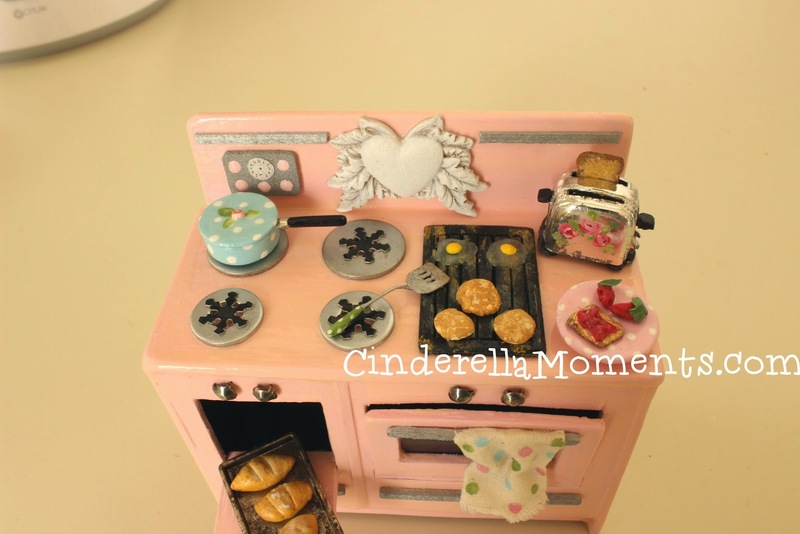 I love how your stove came out it's gorgeous and I love all the miniatures you made yourself like the bread, the strawberries, the spatula, the eggs...everything look so cute and well put together! And like everything you make there is the Caroline's touch....the magical, fairy touch!! Hugs! That is so cute. I love everything about it. Especially the griddle, it really enhances it. I think I better start with the food first and work my way to up to the stove, lol. Thank you for sharing!! The stove is wonderful!! Thats clever it looks wonderful! wat een heel mooi fornuis heb je gemaakt. wanneer mag ik komen eten???? It´s a beautiful kitchen! I have a spring giveaway, Would you like to participate? hugs. 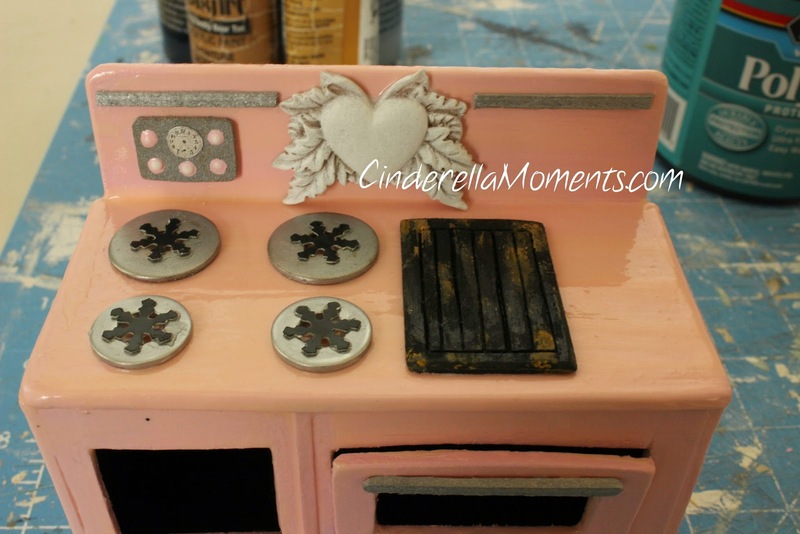 Oh My Gosh you are an Absolute Genius - That is the CooLest Tutorial I want to try it sooo badly - Oh Heavens I Love that PinK oven - TiGGy sooo has Gotta have This! Oh Thank YoU!!! Wow! 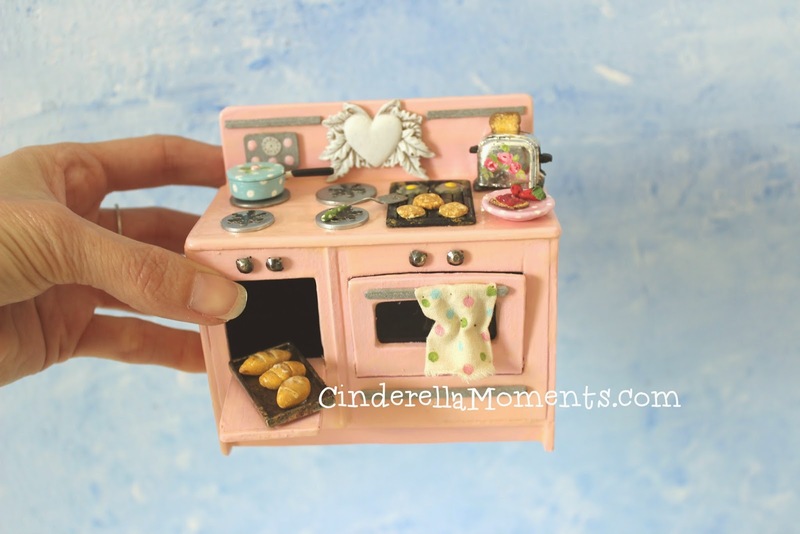 it´s a perfect kitchen! Thank you for sharing this lovely tutorial. I missed this and am happy to come back after seeing the link in your post today. Your tutorial was just posted on a Miniature Facebook page!! This is amazing! 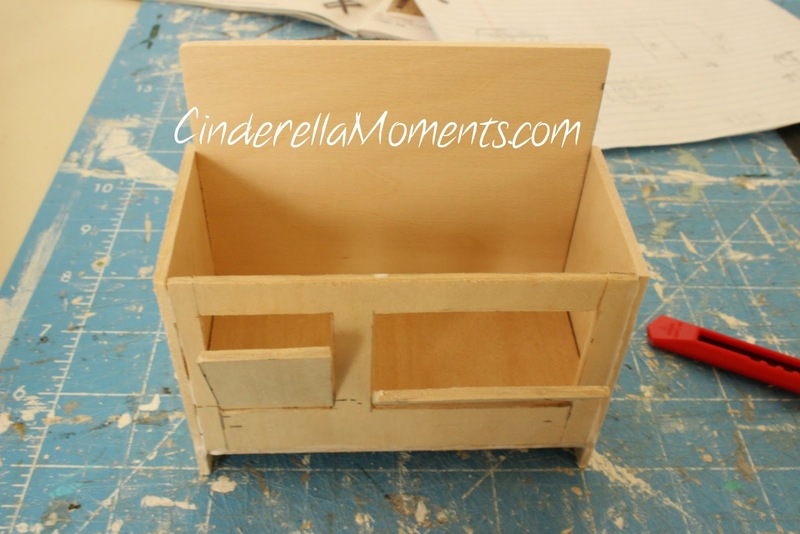 I can't wait to create this for my dollhouse! Thank you, thank you!!! Me gusta muchísimos todos sus trabajos y la explicaciones de los tutoriales son una maravilla. Yo tambíen hago casas en miniatura, y sin duda aquí podré aprender mucho. Muchas gracias por compartir sus conocimientos un abrazo.